Well, I’m off on holiday for a week so the site will not be updated during that time. Meanwhile, why not pass the time away watching the following: The first two episodes of Dr. Horrible’s Singalong BlogÂ are already up with the final part released on 19th. Enjoy. Boardgamegeek has lots of tools to satisfy that small minority who love statistics. I’m a bit surprised I’ve not embraced every whizz-bang facility that is available but I have at last, after 8 years of using the site, got my collection logged and ratings added (although I am still to add ratings to those games “played but not owned” before my move back to Shrewsbury in 2001. I admit though that I think I do have the records for these games all the way back to 1993 somewhere. 637 games have been rated by me on BGG, of which 513 I own, meaning I have 189 titles that I have not played / rated. This is higher than my own unplayed list of 136 games probably due to expansions that I have not classified on my own site. My average game rating is 6.62 (out of 10), which is slightly higher than BGG’s guide but reflects the fact that I like a wide variety of games playable in different settings (I rate great family/party games as highly as great gamers’ games). My lowest rated game is Yeti Slalom (3), a train wreck of a game that I cannot understand managed to get past any rational playtester. I have never rated a game a 10. It is just that explorer in me that strives to find the ultimate and when I get close, I just set the bar that little bit higher. Of theÂ nine games rated a 9, four of them (Caylus:MC, Notre Dame, Phoenicia and Stone Age)Â are too recent to guarantee that they will stay there; the other five (Ave Caesar, El Grande, Liar’s Dice, Ra and San Juan) are unlikely ever to fall from their lofty pedastal. Author Garry LloydPosted on 13th July 2008 Categories SnippetsLeave a comment on Boardgame? Geek? Me? After the debacle that was the Agricola scoring last week, I knew I was in for some stick this week so I thought Iâ€™d try and calm everyone down with a nice stroll through the lake district. Unfortunately, this was winter and the previous weekâ€™s farmers were all for saddling me with the heavy rucksack. The trip from Ambleside started off with fine weather as expected but with all the target locations in the north west of the map, most of us were competing along the same couple of routes. Steve, however, took an early ferry and started working his way on a more southerly westward tack. The weather quickly turned nasty and my cards meant I was stationary for a couple of vital turns when hoping to get to my first target. Things then took a turn for the worse as I drew the heavy rucksack, hampering my progress even further. By noon, I still hadnâ€™t reached my target but I had just managed to pass on the rucksack, which Nige and Mark K then decided to trade among themselves for a couple of hours without moving. Guy managed to slip past them and was making really good progress and building up a big lead. We tried to slow him down with the heavy rucksack but this just prompted him to try and get back to Ambleside post-haste. He didnâ€™t make it within the hour so we managed to vote it off him and onto â€¦.. me! Lacking in points, cold, and no bus in sight, I vainly tried to get home before the five oâ€™clock deadline, picking up a couple of blisters for my trouble. Mountain Rescue was called â€“ humiliation was complete. Guy won quite comfortably, even managing a trip round the lake before going back to Ambleside for an early supper. 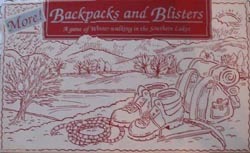 More Backpacks & Blisters is full of theme and is a fun experience. There is a fair bit of randomness but there are things you can do to offset bad luck. Planning your route to best utilise your cards requires some thought but donâ€™t bank on the weather staying still for more than a couple of rounds. 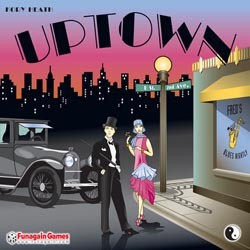 We then tried Uptown, which Iâ€™ve been itching to play for a long time. Designed by Kory Heath and published by Funagain Games, it is a very clever abstract game of placing your tiles to form the fewest connected groups as possible. The rules are so simple that you could be deceived into thinking the game is also simple. Far from it. There is a lot to think about every turn, even though you know all the tiles you will need to play, the order in which they appear can make or break how youâ€™re planning to make your tiles connect. Nige was really impressed with this, his rating improving the more we got into the game. We played a relatively friendly game but I suspect on future playings, people will mess more with other peopleâ€™s positions as there is good opportunity for blocking moves. Steve illustrated this very well by blocking Mark K at a critical point and ensuring he was unable to connect up his two groups. I managed to keep one step ahead of the others in terms of keeping my long chain of tiles connected and, even though Steve tried to scupper my plans on the last round by replacing my joker tile (which Iâ€™d played just the round before, I was still able to keep just one connected group and take the win. Excellent stuff and, even though Iâ€™m not a fan of pure abstract games, this one really does hit a sweet spot. The next session of the Shrewsbury Boardgames Club will be on Friday 11th July and will be at Garry’s house. 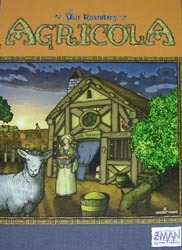 Well the long wait was over and tonight we finally managed to play the brand spanking new English edition of Agricola. Designed by Uwe Rosenberg and published by Z-Man Games, Agricola is a development game based around farming where you are trying to build up your farm and family while making sure everyone gets fed. The scoring at the end takes account of so many different areas of play that you can never succeed in every aspect so you need to pick which ones to concentrate on. With so many different cards in the game, it is likely to play differently every time and as it accommodates between 1 and 5 players, it should see a fair amount of play. Having read on BGG strong recommendations to play the family version on the first attempt, I set things up for this version only to find Nige very determined to go straight into the full game. So the full game we went for and, although it did take quite a bit longer to play, about 3 hours 15 minutes, the addition of the Occupation cards and Minor Improvements didnâ€™t make things that much more complex. My cards did not look terribly good on first examination, especially when compared to a couple of really nice cards played early on by Guy and Nige. I did eventually work my farm round to making good use of my Occupations but it took a while. Guy did lots of ploughing and got a nice crop production going whereas Mark K and I concentrated on grazing although this meant we were eating our livestock on a fairly regular basis. I was the only one to upgrade my buildings to stone (I had a card giving me a discount on renovating and one giving a bonus 2 points for a stone farmhouse), although everyone else but Guy managed to renovate once. Nige ended up with the most family members (5), closely followed by Mark K, whereas both Guy and Mark G stuck with their original two farmers throughout. None of us was sure who had won due to the complexity of the scoring but, when I had totted everything up, it appeared Nige had triumphed by a single point. I say appeared because it wasnâ€™t until I was clearing the game away that I realised I had short-changed my own total by 2 points, meaning I had pipped Nige by a single point. We all thought the game was very good although itâ€™s not quite up to the hype it has been getting. The thing it really has going for it though is the replayability. Mark K knocked it down a notch due to the time taken to play but Guy gave it a top mark of 10, as he liked the way you developed in your own way and people couldnâ€™t mess with your plans (other than nabbing the action you wanted before you). Iâ€™m looking forward to trying this more and hopefully will get the family to give the introductory version a go. Author Garry LloydPosted on 5th July 2008 Categories SnippetsLeave a comment on Sorry Nige! Just a reminder that this weekâ€™s session of the Shrewsbury Boardgames Club will be on Friday 4th July at Garryâ€™s house. We got to play Tribune tonight, designed by Karl Heinz Schmiel and published by Fantasy Flight Games. However, it turned out to be a much shorter experience than we expected. We opted for the medium length five player game which involved achieving three victory conditions with a compulsory Tribune. On the first turn, my cards pointed me towards the Senator faction but a Vestal Virgin leader on the first regional building looked too tempting so I also set another worker up for a second Vestal V card. Mark G had placed a worker to takeover the V.V. faction so I decided to bide my time for turn 2. Having successfully taken over the Senators, my path was clear and I (over)bid to ensure I got the chariot to protect the Senators and concentrated on the two available V.V. cards that turned up in the second round. This meant that I was able to gain both a Tribune and Favour of the Gods and ended the second turn just 1 ducat short of the 30 needed for my third victory condition. It was, by that stage, obvious that I could easily win on the next turn as nobody else looked to be able to get to three victory conditions so we stopped the game there. Although I was pleased my plans fell into place so well, we were all disappointed the game was over so quickly and ratings suffered as a result. 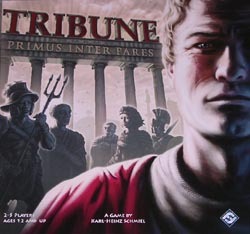 I think playing without a compulsory tribune would make the game more wide open and, as there are other variants included in the game that don’t require a Tribune, we’ll just have to try one of those next time. That said, I thought the mechanics were really good and I hope we play again soon – maybe with fewer than five players. 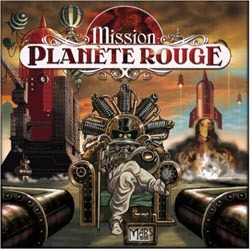 We then opted for a game of Mission: Red Planet which all of us other than Guy had played before. That said, we all seemed to have forgotten the rules so it took a while to refresh our memories. The first round saw two of Steve’s guys get lost in space and so he spent most of the rest of the game pointing out how far behind he was, although I’m sure he knew none of us believed him. Guy scored really well in the first two rounds of scoring but then got picked on a bit so faded in the final scoring and had one of his potential bonuses sabotaged by my final turn removing one of his guys from a vital sector of Mars. Nige looked to be finishing strongly by controlling both a ‘2’ and ‘3’ value region and he managed to score both his bonuses as did Mark G. However, Steve was raking in points in lots of regions and critically got the bonus for most ice points, adding 9 to his score and taking the win by 3 points. M:RP remains a really fun game although it is pretty chaotic – a typical Bruno Faidutti trait. Guy liked it as well although he probably trimmed a point off his rating for having been picked on at the end.